.300 Winchester Short Magnum (also known as .300 WSM) is a .30 caliber rebated rim bottlenecked centerfire short magnum cartridge that was introduced in 2001 by Winchester. 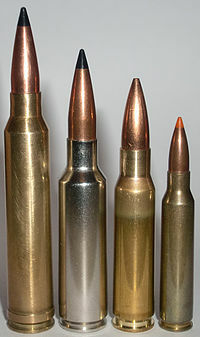 The cartridge overall length is 72.64 mm, cartridge case is 53.34 mm in length and the bullet diameter is .308 in (7.62 mm), which is common to all U.S. .30 caliber cartridges. The principle at work in the short magnum cartridge is the advantage of fitting larger volumes of powder in closer proximity to the primer's flash hole, resulting in more uniform, consistent ignition. .300 WSM has 80 grains H2O case capacity. The 30-06 Springfield has 69 grains of H2O, 308 Winchester 56 grains of H2O, and the 30-30 Winchester at 45 grains of H2O case capacity. The 300 Winchester Magnum has Case a H2O case capacity of 93.8 grains. With this aspect of near identical performance of the 300 Winchester Magnum, the .300 WSM does this with about 14 grains less of powder behind its bullet. This demonstrates a clear superior engineered design behind the .300 WSM. The .300 WSM also head spaces off its case shoulder versus the older 300 Winchester Magnum's belted head space engineered design. The advantage to this round is the ballistics are nearly identical to the .300 Winchester Magnum, but in a lighter rifle with a shorter action burning 8 - 10% less gun powder. A disadvantage of cartridge case designs with relatively large case head diameters lies in relatively high bolt thrust levels exerted on the locking mechanism of the employed firearm. Also in small ring actions the larger chamber diameter removes more steel from the barrel tenon making it weaker radially. The .300 WSM is adequate for hunting moose, black bear, brown bear, elk, mule deer, and white-tailed deer in forests and plains where long range, flat shots are necessary. The .300 WSM is also used in benchrest shooting. The .300 WSM has a standard bullet diameter of .308 or 7.62mm and takes advantage of the numerous bullet options available in that caliber. The .300 WSM is a Delta L problem cartridge, meaning it can present unexpected chambering and/or feeding problems. The Delta L problem article explains this problem in more detail. The .300 Remington Short Action Ultra Magnum has very similar cartridge dimensions but is not interchangeable. Wikimedia Commons has media related to .300 Winchester Short Magnum. C.I.P. TDCC datasheet 300 Win. Short Mag. This page was last edited on 3 March 2019, at 03:12 (UTC).